Web Design & Magento Development. Web Design, Magento, Ecommerce, Development, SEO, PPC & Strategy. 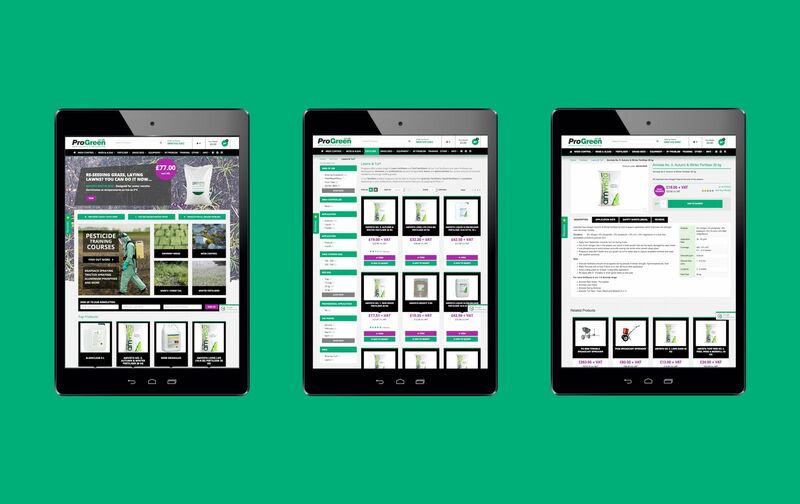 ProGreen are an online and bricks & mortar retailer dealing with total weed and ground control solutions. Based in Lincolnshire near Peterborough, not only do they sell products to the general public and professionals, but they offer National Proficiency training for professionals looking to hone their skills. The existing site had served them well, there were good sales on flagship products and a loyal customer base; however, it was tired and needed a desperate overhaul to address static search visibility and spark new direction in business objectives. Progreen asked us to help them initiate this new growth. Essentially we needed to uplift the digital brand and enhance the mobile and tablet experience. Starting at the beginning is usually best, so analytical data was scrutinised before jumping to any conclusions. After spending some time looking through Google Analytics, our SEO and technical team were able to make recommendations on the initial strategy. Several things needed to be addressed to spark this growth. 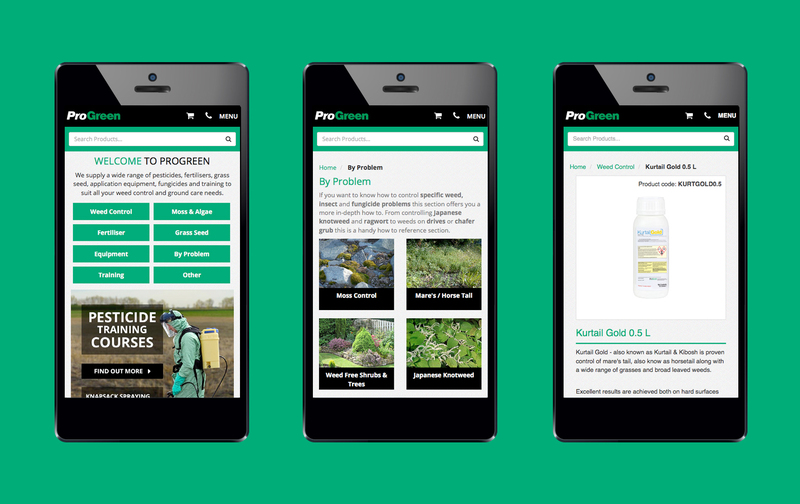 So, first things first, ProGreen needed to be found online. With the site not offering a good experience on a mobile device, consideration was given to further factors; Google offers better page rankings for mobile friendly websites, and with the majority of visitors coming from a mobile device – we needed a mobile responsive website. Next, we needed to pay attention to the customer journey and what they wanted from their experience with ProGreen. This involved build and design with Conversion Rate Optimisation in mind. Giving the impression of a company with authority was key. ProGreen spend a huge amount of time investing into customer care, imparting a huge amount of knowledge to their customers on a daily basis. We know that with content marketing and lead nurturing, becoming a leader in your field (ouch, did we really just make that pun!) is imperative to building trust with your audience. With this in mind, visual and written messaging had to be on point. 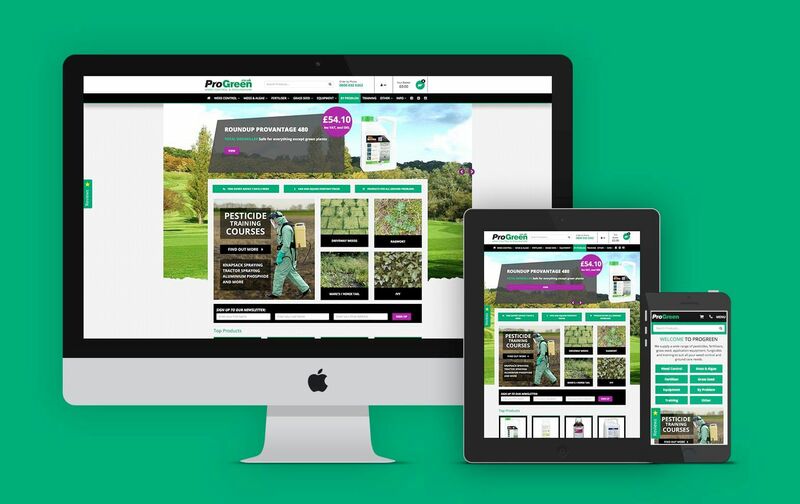 We have seconds to make the right impression when a visitor lands on a webpage – we addressed this by giving an impactful visual style aligned to ProGreen’s services and products. Written messaging is clear, impactful and to the point. It has been presented in such a way that it gives the right information to the user, no matter what device they are visiting from. Magento Development; as a choice of platform here was never in doubt – getting it to jump through hoops to manage the data and present a fast-loading, user-friendly, sales-converting experience was where the challenge lay. Careful consideration was given to getting all these elements right; using the existing analytical data and running live tests on the existing site allowed us to piece out the necessary steps. Starting with wireframing, the thought processes began to map out the engagement strategy. Each subsequent stage was created, expanding upon the previous, at all times consulting with the client and working closely with them to create a search-friendly website. ProGreen have raised their game, they now look like the professional and highly regarded outfit they really are. Working together, we have accomplished some very difficult challenges with complex product set up and shipping rules, applying all this into a mobile responsive environment. For the target customer, these additions have greatly improved the experience and conversion factors of the site. The new website, coupled with our technical audits and recommendations, allows for greater quality scores for their PPC campaigns – in turn lowering spend. We are now able to take forward the foundation, poised to run a series of additional marketing campaigns to generate further revenue.